DentalWorkers Who Learn Together, Refer Together! I Want To Refer A Friend - That Sounds Great! Fill out this form to learn about referring a friend. 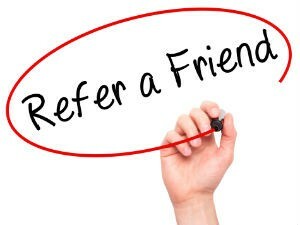 Do a friend a favor and refer them to DentalWorkers! Have you recently finished school to become a dental assistant or a dental hygienist, or one of the many other exciting careers the dental field has to offer? Do you know a dental worker who is looking to return to work after a break in the dental industry? Whatever your situation, you have found DentalWorkers.com, and we hope you have already taken the time to register for FREE, add your own resume, or perhaps you have utilized our intuitive and easy-to-use Free resume builder, and not surprisingly, perhaps you have already found your ideal job through using DentalWorkers.com!